I was 20 when we were married. Generally speaking, I didn’t know much of anything. I knew I wanted to marry Daniel in a church. I didn’t even care so much which church (it was a few years before we became Catholic). I didn’t care what our wedding colors were. It didn’t make much of a difference to me what song played when I walked down the aisle. It was before Pinterest. I just wanted a white dress, a ring, and to be married. Looking back, it was a sweet wedding. A few flowers. Some candles. Bridesmaids, groomsmen, family, and friends. We ate some cake, had some punch, sang some hymns, called it a day, and began a marriage. But there’s one thing I look back on and deeply regret (other than missing out on a Catholic wedding): children were NOT invited. I was adamant about it. We only included the names of grown-ups on the invite and then set up childcare at the church so that if someone was so crazy as to bring children to a wedding, we could nip that in the bud right away. I think we told the ushers, if you see anyone with children, tell them there’s childcare in such and such room! Don’t let them in! They might…….What did we think they were going to do? Talk? Cry? Run around? I’ll tell you. I thought they would RUIN THE WEDDING. What if a baby started crying during our vows? Wedding ruined! What if a distracting kid ran around through the aisles? Wedding ruined! You see, I didn’t get it. I thought a marriage was all about me and Daniel. I didn’t understand that separating children from a marriage revealed that I didn’t understand a central truth: marriage is about so much more than two people in love. It’s a reflection of Christ’s love for the Church. And God’s love? It’s bigger than just the two of us. It’s a love that’s always giving, always sacrificing, always delighting in the gift of life. And children are the beautiful fruit of married love. I also didn’t know the first thing about what it was like to be a parent. That barring children from the wedding might mean that it wasn’t possible for some families to come. That they would be excluded because I wanted a perfectly silent wedding. I didn’t understand any of that. I didn’t understand that being pro-life means including little ones in Christian life because they are part of the Body of Christ and Jesus wants them there. And I didn’t connect marriage to the idea of children at all. That was a decision for down the road after we’d had plenty of years for just us. It wasn’t until we were unexpectedly blessed with our first child that I started to get it. Children strengthen and perfect married love, they’re not interruptions or inconveniences. They’re kind of what it’s all about. Children aren’t accessories to marriage. Instead, one of the primary purposes of marriage is children and creating an environment where they can thrive and be loved–setting a foundation for understanding that they are beloved by God. We recently had the privilege of attending a wedding of a dear friend. Now with three young children, attending an out of town wedding where children aren’t invited really isn’t an option. So, I asked the bride in advance whether it was ok to bring the kids or if we should look into childcare options. I breathed a sigh of relief when her answer was, “bring them!” And when we arrived at the wedding at the Saturday evening vigil Mass, it was clear that this couple got it. They understood that their marriage wasn’t all about them. It was all about Jesus. It was about God pouring out his grace on them while their community of all ages rejoiced with them. The Mass wasn’t even exclusively for the wedding! The wedding guests mostly arrived early and sat in front in their finery while the other Mass attendees found their seats and murmured, “must be a wedding today!” We worshiped together, received the Blessed Sacrament and our friends were married. In two years we’ll celebrate our 10th wedding anniversary. Now that I know that children can’t ruin a wedding just like they can’t ruin a Mass, I wish we could go back in time and invite children to our wedding. But since time travel isn’t an option, we’ll be throwing a big party. And you can bring the kids. In fact, I’ll be disappointed if you don’t. UPDATE: We did have that party. And there were kids everywhere. And it was perfect. I was twenty when I was married, and like you, I didn’t care about much more than our rings, my dress, and to be a Mrs to my Mr. I agree! On the other hand, I’ve been to a beautiful, formal evening wedding (in town) where kids were not invited, and it was really nice to have a date night without them! My favorites are always still the weddings with the mayhem of children, though. Beautiful! Thank you so much for writing this post! I was married very young (just celebrated 24 years), as well, and children were at our wedding because I had much younger siblings! 🙂 Recently, two of my husband’s nieces got married and they only invited my husband and I and a couple of our older children (we have 9 children 23 years down to 1 1/2 and are expecting #10 in September! 🙂 ). It was extremely hurtful, especially since one of the weddings WAS Catholic. I did not go to either wedding and my husband and older children went to the one in town. Other family members did not understand why we were upset! I can see that being really upsetting, Irena! Amazing how God can change our perspective. 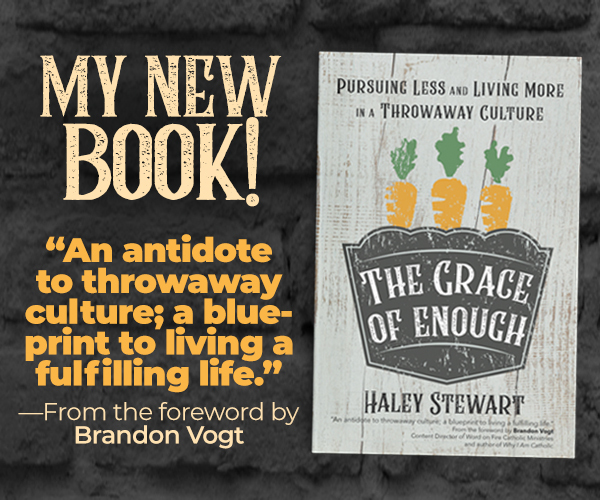 Thanks for writing this, Haley! THANK YOU HALEY! My brother-in-law is getting married this weekend and they don’t get it. I am very torn because my husband and I are both in the wedding and our daughter cannot be with us during the mass. We have to have a babysitter for her. It breaks my heart. I get frustrated when trying to explain this to them because I don’t know how. I will definitely be sharing your thoughts. I always knew we’d have lots of kids at our wedding since my parents are both 1 of 7, and I have lots of cousins. Probably of our 100 guests, about 20 or maybe a few more were little kids. I never really knew that was unusual until we started getting invited to friends weddings that didn’t include kids. Now that we have a son (7 months), I feel so happy when someone invites my husband and I AND our son to their wedding! We didn’t get married in the Catholic Church when we first got married. But almost 2 years ago our children attended our convalidation ceremony! That was very special. Yes, how perspective changes when God is front and center. I love that your friends’ wedding Mass was not exclusively for the wedding. I hadn’t even considered that! beautiful post! I feel like there was so much I was selfish about before having children. I think a lot of young couples are the same way. God Bless you! In our family we have actually had fights over people choosing not to include even family kids (cousins, nieces and nephews; not to mention the children of friends). The way we were raised and the way most of us see it is as you said that children are a natural part of life and of the Church and they belong at our sacraments. I’ve been to both and seriously don’t understand the point of a wedding without children. We didn’t invite children to our wedding but I don’t regret it — kidlets are never invited to any weddings in my family, plus, I’m at a weird spot in the generational rotation where there just aren’t a whole lot of kids in the family (and none of our friends are at that stage of their lives yet). If there were a lot of kids in the family though, I’d like to think that they would have been included, but I can’t say for sure. As for what I regret, I regret that I didn’t think about who I wanted to stand beside me and support me when it came time to choose bridesmaids — I ended up with a “friend” who I felt obligated to choose and she ended up being pretty nasty about my husband/my dress/our faith/our ceremony/the food and on and on and on. …We don’t much talk anymore. I’m still very close to a couple to about half of my bridesmaids, but not the rest. It’s sometimes really hard to gauge who is going to end up being a lifelong friend! But I didn’t have any drama. Sorry about your situation, that sounds pretty awful! Aw, thanks for the sympathy, but it’s not your fault! I like to think of it as a learning experience. I learned patience and grace and hopefully she learned something, too. I love that you had friends that were married during a regular mass! As we change churches, we are merely hoping to find one that has Baptisms during mass. It was SO cool, Hannah. We didn’t have children at our wedding, excepting my nieces and nephew, who were in the wedding party. My cousins were also invited to bring their four-month-old baby. I understand your thoughts, but on one side of my family, there are twenty children under the age of fifteen and our guest list was FULL. We had one hundred and fifty people to invite, and that was mostly family. I tried to let my family know in the nicest way possible that children were welcome at the Mass, but the reception would be late, loud, and long. I simply didn’t have the funds to spare on a children’s table, a children’s dinner option, etc. Most of my cousins seemed to enjoy having a mommy and daddys’ night out. I hope that was the case! I’ve been thinking about this a lot lately. We just got our first invitation to a “child-free” wedding since having our first baby. I used to think this was just a personal preference issue, but now we are really torn about how we will be able to attend this wedding. Personally, I’m all about kids at weddings. We had children of all ages at ours and it was so much fun! When my future mother in law mentioned that we shouldn’t invite children we didn’t “know well”, I objected loudly. She thought I was crazy, but arranged for Legos to be had at our reception. 🙂 We also had kid friendly food, including a fun candy table and fruit tree! If being the oldest of eight taught me anything, it was the hurt of excluding the young, and that children are just a continuation of weddings. I had five young children IN my wedding and dozens AT my wedding. We had a bounce house, though it was really for the grown ups! We had kids at our wedding, and — almost twelve years later — it’s fun to look back through the wedding album and see how small they all were. The babies are now teens … amazing! It’s very ‘circle of life’-y, and nice. I hadn’t even thought of that! That is very cool. I love looking back at the photos and seeing the growth. Our alter servers were our cousins and one is married with three kids of her own now! Time flies!! I have always thought that children should be at weddings. It needs to be something they see modeled just as much as good marriage. Christian weddings are the best places to bring children to give them a vision for the future that we wish them to have. The guest are there as more than gifts. They are there because we want them to witness are vows and hopefully encourage us through our marriage. And children can do this too! Besides, little girls love to go to weddings and see the pretty dresses! Great thoughts; I’ll be sharing with all of my single friends to file away for the future. We didn’t have children at our wedding because we didn’t know many young families seven years ago. There were no young children in either family (other than our ringbearers) and our friends hadn’t started that chapter of life yet. 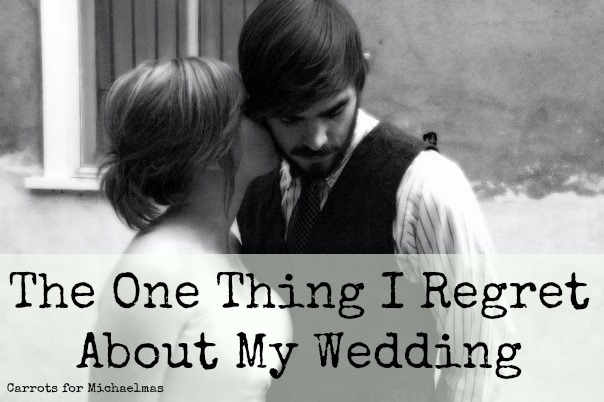 I do have a few regrets about our wedding though; primarily that it was a ceremony instead of a Mass since I hadn’t join the Church yet, and that we felt obligated to invite a lot of co-workers, most of whom are no longer part of our lives…. and my bridesmaids’ dresses were ugly. Some of the best pictures that we have of our small, backyard wedding are of the kids who were present playing together. Love it. PS – also a big fan of small weddings and BIG ten-year parties – the successful marriage is something to celebrate! Oh for sure ! No one danced at our wedding… except for us and the kids! i am always saddened when my kids aren’t invited to a wedding. weddings are a beautiful picture of the love of christ for the church and it is a shame to exclude the little ones from that opportunity to learn. i always love the conversations that we get to have with our boys after a wedding, and its a shame that they are not invited to more. I agree! Weddings and baptisms are always so good for kids to attend! We knew there would be lots of kids at our wedding, and my mom had the foresight to arrange a bunch of games and things to keep them busy at the reception. I think they all had a lot of fun. I’ve been to weddings both with and without my kids, and I kind of prefer to go without them if we can. Like someone said above, it’s nice to make it a little date. But, if we can’t arrange childcare, it’s also nice to know they are welcome so that we can celebrate with our friends and family no matter what. In a different but similar vein, I absolutely hate destination weddings. Talk about making it difficult for people to join in! Don’t bother inviting me if it’s in some exotic location with expensive amenities. One of my childhood friends is getting married in Central America this weekend, and it just says to me “We really don’t care if you can come or not.” Well, we won’t! AH! oh, Haley, how courageous you are to write this. From someone who used to despise children and now must fight back tears at the sweetness of a newborn, I know your realization, your conversion more fully to God’s love. I super love this post. I agree wholeheartedly. We had an accidentally-kid-free wedding (no young cousins + getting married a week after college graduation), but I would’ve asked for no kids present and I would have regretted it. What a lovely reflection. I wasn’t Catholic when my husband and I got married, and gosh my perspective on marriage has changed a lot since converting even though I was Christian before. I give a talk every year at the confirmation retreat about community and I always talk about my cousins wedding and how she included everyone in the wedding and the pre-wedding activities. It was awesome! But I think she did that b/c she talks about her cousin that lived and got married out of state when she was 6. Her cousin asked her to be a flower girl and they were cool with that and then they told her parents that my cousin wasn’t allowed to the reception bc it was an adults only reception….and in a city they knew no one but family they would have to find a babysitter. So her parents decided they wouldn’t do that and she wasn’t a flower girl and they went to Disney World instead. At my sisters wedding we had a little kid table with a bag of games and coloring things we got at the dollar store. Yeah having kids in the wedding sometimes made things complicated but it wasn’t a big deal. She didn’t get married in a church but I think when you get married in the catholic church and kids are explicitly in the vows it’s weird to say no kids. But I know sometimes it’s a numbers thing and weddings get expensive. Amen! I was 22, requested no kids, and regret it for the same reasons as you! I know there were people invited to my wedding who didn’t come because kids were limited to cousins, babies and a few out of town families. We kind of drew the somewhat arbitrary line at, “Do we even know the kids?” It’s one of those really tricky things and when my kids aren’t invited I know to be as charitable as possible to the bride and groom. The things is, when you’re a Catholic with parents from Catholic families marrying another Catholic whose parents are both from Catholic families the guest list can get out of hand really really quick. I wanted to invite my high school youth leader, but I had space for 2, not 10. And while we could have made allowances for a couple such families, we just couldn’t have done it for all of them. Or so says the fire department. (we had no hopes for a fancy hall either, there was as much space as one could ask for but even so…) Shortly after my wedding a friend intimated to my mom that not inviting kids to my wedding was anti-family. It was hurtful to hear. This friend did not come to my wedding so she likely did not know that there were lots of kids there. I think it was very thoughtful of you to ask your friend if the children were invited to her wedding and I personally wouldn’t have been offended if someone told me that their wedding was only for adults. You see, it’s never the kids I have trouble with, ever – kids act like kids and that’s to be expected – it’s the grown-ups. In the last few years I’ve been to over a dozen of weddings and I cannot tell you how many times I’ve witnessed people let their kids yell, scream, cry, throw tantrums, bang on things, walk around the church etc. – you name it – without making any effort at all to take them outside until they gain composure (churches in my country don’t have cry rooms). They – the parents – act like it’s cute and funny and adorable but it really isn’t. It’s really annoying. To everyone. It would all be so much less annoying if the parents showed at least some kind of effort to calm their children. But they don’t. I think children are little people and it’s only natural to include them in everyday life but I cannot understand why would anyone willingly let their child make something as beautiful and holy as a wedding – and especially if it’s something that happens only once in your lifetime – anything less than enjoyable for everyone around. I have been to weddings where kids have run around during the ceremony and were loud and distracting and you couldn’t hear the vows. I’m sorry, just not how I envison my wedding day… Especially when you spend a lot of money on videography. With that being said, I am providing child care for children under 8 at the ceremony. I feel like children over 8 are big enough to sit and be quiet. All kids are invited to the reception. My venue will be at a carousel, which is actually very kid friendly. I feel that your ceremony should be very intimate because it is about two people joining as one. There shouldn’t be tons of distractions during this special sacred moment. YES. I absolutely love this. We didn’t invite children to our wedding either (it was expensive to have “more heads” at the reception! we wanted an “adult party! my sister with two young kids assured me that “parents like a night out!”) and it’s the one thing I would change, too. Not simply because I understand now how much harder it is for couples with young kids to attend weddings, and I would want to give them the choice to decide for themselves what was best for their family. But because, as you state so beautifully, children belong at weddings. They are inherent to the heart of marriage. Now it seems ironic to me that my husband and I gave an enthusiastic “yes!” to the question of whether we would accept children lovingly from God, and yet we didn’t even invite them to dine and party with us that night! 😉 We love going to weddings with our children now, and we love seeing how much they enjoy being included in what they instinctively know is a Really Important Day. We just got married on 6/7 and there were plenty of kids afoot. My husband has a big Mexican family and we would never have thought of not inviting kids, but we also have a 5 year old, so that could color our view? At any rate, the kids absolutely MADE our wedding. I can’t imgaine what it would have been like without them. Congrats on your wedding- and blessings to you!! While I understand and appreciate the sentiment of children being important, wonderful, and an extension of Christ’s love to the world, your statement that children are kind of what marriage is all about bothers me. I feel it is very neglectful of people who cannot have children, as if their marriage means less because they do not have kids. While I am not married, nor do I have children, I had surgery which implicates an extremely high likelihood of infertility. I do not like to think my eventual marriage could be “less than” if I end up not being able to have kids. I do understand that the context of this post is to say children shouldn’t be excluded from weddings because they are a part of our lives and shouldn’t be left out of momentous occasions to see love and Christ’s love at work. Maybe it was just the wording, but I’ve known too many people with fertility problems, seen too many women and men struggle to feel like their marriage is worth it because of not being able to have kids. If I cannot have kids, so be it, I’ll still have my husband and God and that will be enough. Totally! Marriage binds me to my husband…we get married because we want to work at getting each other to heaven. All married couples are called to be open to children but not all married couples are called to have children, why God has worked it our that way I do not know, but I know He has our best in mind. Marriage is about a husband and wife. I am bound to my husband, and while I cherish my baby and love her more than I can say, I am not bound to her. I get what you are saying about kids at weddings…maybe the author regrets the reason that she didn’t have kids at her wedding. For us it was not any aversion to children or fear of distraction…it was logistical and financial. I have a 5 month old now and I hope she gets invited to some weddings. But I will TOTALLY understand if her name is not included on every invite….that’s when it is time for parents to decide about childcare and whether or not to attend the wedding based on what arrangements they are comfortable/not comfortable making. I do get what the author is saying, but there are a lot of good catholic couples out there doing their best to plan a wedding and I have never seen one where one guest or another doesn’t have a criticism about one thing or another…which is unfortunate. Betsy – I understand, as an IF married woman myself, that it’s hard to see people come from view point that children are an important part of the marriage – it can hurt so much when you’re not be given this. I know Haley, she’s not the type to judge on how many kids a Catholic (or any marriage has) and that’s not a sign of the marriages value to her. She is just emphasizing what we are taught about marriage – that children are a “fruit” our marriage sacrament, but she doesn’t say “biological” or even “adopted”; it’s all children should be a fruit of our marriages, nieces, nephews, children of friends, the kids in our parishes or down the street. We should show God’s love to all the children in our lives, and what a great way to do that than buy including them in the joy and celebration of a wedding! By showing them from a young age the importance of ALL the sacraments in their lives. Children are “kind of what marriage is all about”, not because it’s important that every marriage have a Catholic dozen, but that children (whether ours or not) give us a great opportunity to grow in God’s love and I’m pretty sure God doesn’t keep away from him because we might be messy or loud or have the occasional temper tantrum. My sincere prayers for you in your journey; that God gives you strength and joy on such a difficult path. God bless your marriage. We also had a wedding where children weren’t allowed. Interestingly enough, someone brought their adorable three year old because her husband was unexpectedly deployed. She didn’t ask she just brought her. One of the sweetest moments of our wedding was when I walked in and my MOH was fixing my dress around the chair… the little girl yelled out “WOOOOOOWWW”. Everyone laughed with joy and to this day one of my favorite pictures of the wedding was of that moment … our faces and the faces of our officiants were PRICELESS. So much joy and happiness is captured in that one picture… I am so grateful that little girl was at our wedding!! We have a large family and all (then) 15 nieces and nephews were in our wedding! That said, my parents had a lot of local friends that they wanted to invite, but because of our budget, we couldn’t invite the whole family. Some ended up bringing their kids anyway, but it worked out because there were some out of towners who couldn’t make it. I agree that children make marriage so sweet. Almost 4 years in…and two daughters to show for it, my husband often says without them we’d probably be a lot more selfish…and bored! I am getting married in a month and a day and we are definitely having children at the wedding. We are using the children’s choir for the music and all friends and family are encouraged to bring their children. We want a wedding that is full of life and children are part of our future. Also, having children from the parish participate is important because we wanted something that was based on community. Letting them be a part of a sacrament will help them understand different parts of our faith. I have a large family and come from a large family- I love kids, think they’re important etc. But apart from cousins and nieces, nephews and sibs I don’t see any compelling reason to include children in the invitations. Weddings are costly and too many times we can’t invite friends we would like to include – why would we invite a children “just because”? I get it, that the attendance of an out of town couple might require inclusion, a judgment may be made in certain circumstances, but I’m uncomfortable with the expectation that if you “get it” (ie children are important, we are prolife) you must include everyone’s children. It’s not a fair expectation. As a mother I find your attitude incredibly hurtful. If you don’t care about my kids then how can you really care about me? In my opinion you can’t. But is that fair Bonnie? I vividly recall preparing for my wedding 7 years ago, drafting out a conservative guest list and realizing that we had to cut 180 people. 180! So we did and several of them were single friends and several of them were children and many of them were disappointed but I really really hope that none of them felt that they weren’t invited because we did not care about them. That was not it at all. We had no children in our wedding party put it wasn’t out of any malice/conscious decision-making. We don’t have any nieces or nephews and we were the first of our friends to get married. I couldn’t imagine asking a kid I don’t know that well (and consequently, his/her parents) to deal with all the stress/scheduling/money that comes with standing up in a wedding just for the sake of having children in the wedding party. I have a friend getting married in October who is Catholic and is having a no children wedding. She loves kids so I really don’t understand, especially since I have no indication it’s a money issue. I am so tempted to share this with her. Do what you want at your wedding, but please consider respecting your friend’s decision for hers. Sharing the article to guilt her seems pretty harsh. I get and respect what you’re saying, but I don’t regret not inviting kids to our Nuptial Mass. Not at all. I didn’t invite kids out of love for my dad, and my love for kids: I didn’t think it was developmentally appropriate to ask them to sit through a long quiet Latin Mass and then brunch where they’d just inevitably get in trouble for being a kid (after a 3 hour drive from where most of them live) and I didn’t want my dad, the grandpa of most prospective kid guests, to be the one taking them outside, as he does at every other family wedding. When I asked him about it ahead of time, he was so grateful. Was it selfish? Maybe. I prefer realistic. Realistically, they would’ve been bored and grumpy, their parents would’ve been frazzled, and my dad and his martyr complex would’ve taken them all to the vestibule and missed most of Mass. This is wonderful, Haley! I’m not married yet, obviously, but many of my cousins have had “no-kid” weddings, and they all seemed to empty. One of my favorite parts of our wedding tape is hearing a friend’s 20 month old looking at another friend’s 8 week old and saying, “Baby, baby!” Those girls are now 24 1/2 and 23. One friend brought her six year old and infant, but left the 2 and 4 year old with a sitter; her choice to better enjoy the wedding. A three year old turned off the lights during the reception. The switch was just her height to play with because of a ramp that replaced stairs. We babysat our friends’ kids frequently during our courtship. Watching seven kids under seven (from two families) was great preparation for marriage. And I could hardly wait to start having our own. Sorry to buck the trend but I am getting married next year and will not be having children at our wedding. There are a few reasons for this – one being trying to control numbers and cost, another being safety as the location is outside with lots of candles and lastly, I just don’t really like kids. Some people just can’t understand this but it is personal preference, I have never wanted to have children of my own and we both would prefer to have our wedding as an adult only event. The few friends of ours that do have kids (most of them have also chosen not to have children) were the first to recommend not having them there as they wanted a night out for themselves. Jan, to be honest, I don’t think you can describe “I just don’t really like kids” as a “personal preference.” Surely you would think it’s unacceptable for someone to say, “I didn’t invite grandparents because I just don’t really like old people” or “I didn’t invite women because I just don’t really like them” or “I didn’t invite anyone of Asian heritage because it’s a personal preference.” It’s your wedding and perfectly fitting to carry it out as you see fit. But “personal preference” does not really make sense regarding a huge demographic of humanity. I was like Jan. As a teen, I hated babysitting; as a young adult, I avoided socializing with people with kids and I certainly didn’t plan to have any! Well–maybe ONE, but not until just before I got too old and when it fit with my career, and just so I could say I hadn’t missed out on anything life had to offer. Then I met a man. And that man introduced me to the Gospel. And once I let a little crack open in my heart–everything changed. I discovered life beyond myself, my career, my sophisticated mind. And as much as I loved the man I married, I loved God even more and it seemed the most natural and obvious thing in the world to me that we would welcome children into our lives. LOL! The only thing that seemed odd to me about this 180-turn was that someone so intelligent had been so clueless for so long. And the children that came TAUGHT ME! 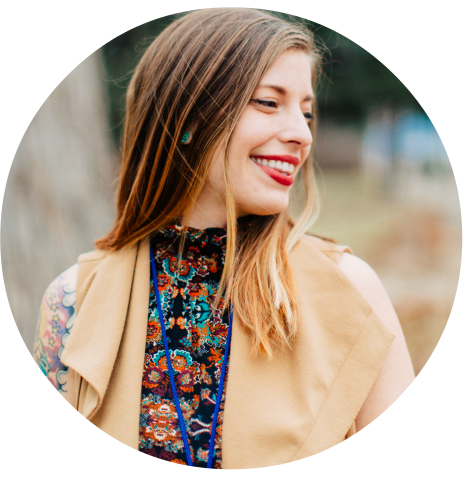 About myself, my parents, God, and how to continue to experience the world through fresh eyes. Now, I see ALL people around me as His children–some are just taller. And I try to share the wisdom I’ve gained (and how to be safe and have fun here) along the way. So, Jan–look out! Once you let a little love in, the darn stuff just gets everywhere!! Even though mine are grown, I can’t keep kids off me now–at church, the grocery store, the library… LOL! And I love it. It confirms for me that I’ve evolved into…someone that their pure, sweet souls recognize as a friend. I am honored to know them. I’m always surprised when we expect children to learn how to behave at cultural events (like weddings!) when we don’t give them the opportunity to rise to the occasion. How will they learn about these things if we always keep them away? My husband and I both regret not inviting children to our wedding too. We only had our flower girls and one of the flower girl’s brothers at ours. We now understand how difficult this is on the parents. We’ll celebrate our tenth anniversary in two years too! I never thought of it in this light, but perhaps the presence of children is why our wedding day made an impression on many of our college/young adult friends. Afterwards they said how much they’d enjoyed it, and how it seemed more fun and meaningful than others they’d attended, though they struggled to articulate exactly why this was so. But my little brother (5yo) read scripture in church, and then opened the dance floor in his tiny tuxedo. Families with littles had their children there, and we did a candy toss, coloring, etc. as others have mentioned. It was as natural as could be to me, but perhaps remarkable to our assorted friends more accustomed to grown-up affairs. Thanks for this insight; it helps me put words to a specialness that we all sensed but hadn’t named, and it highlights a part of our wedding to treasure in retrospect. Totally agree. I’ve never understood the no-kid policy at weddings, when children grooving out on the dance floor, snuggling on their dads’ shoulders and running underfoot is one of the most fun aspects of wedding receptions. I personally find receptions rote and stodgy and not super fun, especially if you’re not part of the wedding party or super close to the couple. But kids provide needed spontaneity and entertainment when most of the night is spent awkwardly getting to know people you’ll never see again. I can understand cost constraints limiting the guest list to kids, but usually only a few couples choose to bring kids anyways. And inviting all the kiddos makes all the parents feel welcome I’m also used to Indian weddings where 400+ guest list is typical and if didn’t invite someone’s kids , they would just write their name in on the RSVP. On the other hand, I don’t support special kid activities at weddings. Kids love being part of the adult community and learning how to act in that setting. Some of my favorite memories are of staying up late and dancing at weddings, listening in on adults’ conversations, and generally feeling “all grown up” at 5. The best way to teach kids the proper behavior for different situations is to put them in those situations, where they can imitate others. Oh and I just wanted to add that, we were also on a VERY tight budget and understand that the cost for kids, especially for families with many kids is a large one. My husband has 7 brothers and sisters and most of them have 3-5 kids, his mother also had about 7 brothers and sisters who each had half a dozen or so kids and they mostly have a few kids themselves. He has 22 nieces and nephews. So I totally get the the cost is HIGH. But, being on a budget, we decided that the MOST important thing about our wedding (aside from the Sacrament itself) was to have our family there with us, especially the kids. So we made our budget fit our large guest list by having almost no flowers, almost no decor, no favors, and we catered in a taco bar from a local place that gave us a discount and had family offer to make sides as a wedding gift. It was perfect for us. I loved this when it came in to my feed and came back thanks to you FB post on the comments. I don’t remember if we had little kids at our wedding or not. There were none in the immediate family and we invited the entire congregation to the ceremony, so I am not sure who all was there. I do love the photos of my elementary age cousins at our tea reception as well as the little circle our junior youth group that we sponsored made. The idea for littles that I loved was one I ran into at a family wedding. The couple brought their little one, probably 14 months to the ceremony and the first part of the reception (same location). Then Grandma picked him up (they were friends, not family) and let the parents have the later part of the evening to themselves while he got to bed. A brilliant solution for a very little one. We are doing the reverse this summer. Letting the kids sleep in and miss the service (only because we fly in wickedly late the night before) and then having them brought to the mid day reception. This is really interesting…I do not have time to read all of the comments. My sister is getting married next year and my children are invited to the ceremony (my son being the ring bearer and I am the matron-of-honor) but we are getting a babysitter for the reception. We had some children (nieces and nephews) at our wedding too, but it was in the afternoon so most of them came to the reception. We had a small-ish wedding anyway (about 80 people) so it was fun. The children were the reason some people were invited to our wedding! As in, my friendships were with the children more than their parents! I knew I wanted lots of children there, and you know what? People still tell us it was the best wedding they’ve ever attended. Wow! I find this post incredibly interesting. I am falling smack dab in the middle of the road on this one. I absolutely, positively did not want to invite kids to our (large Catholic) wedding. My husband’s family was appalled by this so we split the guest list his family got half, his family got half. His family invited kids, mine did not. There were still over 30 children in attendance and I personally paid for a magician/balloon artist for the reception to help keep the kids occupied. I LOVE children. I work with kids and I really do love children. My aversion was that our guest list would be consumed with children and our friends wouldn’t be able to attend. Which was the case, we had very few friends outside of the wedding party due to massive families. The Mass was lovely and if there was crying I didn’t hear it. The reception started off okay. Everyone, adults included, loved the balloon artist and wore their hats around all night. But by 9:00 the room was practically empty. The younger kids all went to sleep and their parents went with them. (Which as a parent I get.) The older kids all went to the pool in the hotel then came back so they were in casual clothes and dripping wet. I obviously cannot go back and change my wedding and in the end it was lovely but I wish I could have invited more friends to dance the night away with me. On the flip side, now as a parent, I find attending weddings with my son is a challenging experience. I want him to behave but he’s 2. And weddings are during nap time. I much prefer finding a babysitter and enjoying myself than being stressed out by negative behavior. And when he does come with us we always divide and conquer now. Whoever is closest to the couple will stay and the other will take him for bedtime. So I can go either way. I am not offended if kids aren’t invited. And I still may not bring mine if he is. Children were definitely a large part of the guest list at our wedding. It is hard when you have a limited budget, but it was very important to us to invite our church family and other friends—many of which have large families. We may have had as many children as adults at our wedding, or possibly more! We didn’t do anything particularly special to accommodate children at the reception, except we had an outdoor wedding and reception, and the farm on which we had it has swings and a merry-go-round, and a couple large fields to run around in. It seemed to work well! It didn’t even occur to me not to have kids at our wedding! There were some little kids I had nannied for and it was really important to me that they were there! And your family was there, though a bit smaller at the time. MY regret was that I had ALL the responsibility on the day of the wedding. We didn’t have a planner, and my mom was really helpful, but with Ruben not speaking much English at the time, and even though our wedding was pretty simple, it was kind of all up to me. I remember at one point things were a bit behind schedule and my mom, the photographer, and caterer were asking me what to do, and I wish someone else had just made a decision because I wanted to be enjoying the day! Not making any decisions! I do NOT regret our decision to have 8 cakes. Sometimes I wish our first dance had been to Micheal Jackson’s Black or White, but oh well. I love your thoughts on this. My husband and I have had a variety of issues when it comes to no kids at weddings. Most of our family/friend weddings are out of town, and it’s not easy to find reliable childcare in our OWN city, much less elsewhere. So it usually means one of us doesn’t go, which is a bummer, too. At our wedding, we were pretty broke and needed to cut costs, so we asked our unmarried friends not to bring guests. Do I regret it? Sometimes, as some of them are married to those same girlfriends/boyfriends. But most aren’t and they all understood at the time. I’m the oldest of 11, and was the first of my family and almost the first of my friends, to get married so there weren’t a ton of kids. But I had siblings and cousins that were little. I can’t imagine the wedding without them. Did they cause a bit of a ruckus? Sure. My littlest sister was 4 at the time and decided at the last minute that she didn’t want to go down the aisle with my other sisters/flower girls. So my dad grabbed her hand and as he and my mom walked me down the aisle, she trailed along. I don’t remember being upset about it, but even if I was, the photos of her peeking from behind my dad’s leg are absolutely precious. The best quote of the day came from my 7 year old sister, who spent the entire night dancing. One of my bridesmaids picked her up at the end of the night and asked if she was tired. She responded, “Yes. But sometimes you have to sacrifice for fun.” It’s a family quote now. How funny – it never even occurred to me to prohibit children from attending my wedding. I did not want them in the wedding party (so no flower girl/ring bearer) though and I’m still glad I made that choice. But I was plenty clueless and I have my own list of things I would do differently! Then after having my first child, I was kind of shocked when my toddler was not welcome at a friend’s wedding where my husband was running sound. They had a teenager doing childcare in another room but when we went to pick up our daughter, she was still strapped into her stroller, parked in a corner of the room being completely ignored. I was SO upset. I could not understand (and still don’t) why they couldn’t just trust me – and all the other parents – to care appropriately for our own children during the ceremony. We got married 3 years ago & my bloke had 3 children, then aged 10,12 & 14. All our friends have kids, his brothers all have kids so we had a 3:1 ratio of kids. It was outside at a friends winery over looking the cherry orchard and Melbourne’s Yarra Valley. It was a perfect summer day, 30c & clear. The kids were all pretty good during the ceremony & then after we had stack of lawn games, cushions & picnic rugs & 3 long tables for everyone to join in a communal BBQ. It was just perfect for us & so right to have every one from 1 year to 84 involved. If I could control the weather, that reception would have been just about exactly what i would have done. But, it rains a lot in MN in June, and this June has been the wettest on record, so I am glad I didn’t do anything outside for too long ultimately. Yes! I heartily agree and I hope every engaged couple reads this and takes it to heart. Thank you for sharing and I hope you don’t mind if I pass it along in my Saturday Round-Up. I’m in a wedding this summer, and the bride (not Catholic) just asked me to make sure I get a sitter for the rehearsal and rehearsal dinner. Part of me is just so hurt by all this (especially as I was also asked to leave the room whenever I’m nursing her, which is much of the time). But reading your blog makes me want to have patience with my friend, because who knows how God might change her heart? Pray for me! Oh, that’s hard, Karen! Praying for you. I think you definitely have your heart in the right place wanting to offer grace to your friend. She’s probably stressed out, unfamiliar with having babies and kids at events, and just needs your patience. Who knows what will happen over time. But very stressful for you in the here and now! This just came up in a Catholic discussion where it was agreed that kids should be allowed for the actual wedding Mass but not the reception afterwards. And “it’s not because I don’t love kids”…”it’s because it would cost too much to invite kids”. Huh? How is cost an acceptable reason to not invite half of someone’s family? That would never fly to say I can only invite your husband but not you, his wife, because it costs too much to invite you. Somehow, it’s perfectly acceptable to draw the line right down the middle of someone’s family because of $$ and not invite their kids who probably wouldn’t eat much regardless. I was one of those people who invited whole families to the wedding mass but 21 and over to my reception. I wanted it this way, this is also my (very devout) parents rule. I come from a huge family, I’m the ninth of forty plus grandchildren and there are 20+ great grandchildren with only a handleful of us married. Finances really do come into play. It would’ve cost several thousands of dollars more to have all of my cousins at the reception. But more important for me was to have an adult evening party. It didn’t start until 6pm and it ended after midnight. I wanted my guests to be focused on their spouses and friends and having fun with each other and not their very overtired children who would without a doubt have made them leave significantly earlier than they actually did. As a guest at night weddings, I have never brought my children (but would if the bride and from wanted me to or it was kid heavy). I really enjoy being able to focus 100% on my husband, dance and drink with him and relish in the memories of our own wedding. We had a few guests at our wedding who were not happy with our choice but they were also not paying the $73/head it cost for the meal of chicken tenders and fries (which, incidentally, was not a significantly different price for the adult filets and salmon). All of my nieces/nephews, cousins and friends children did come to our wedding, we’re included in the mass and we took a picture of the huge entourage afterward. There was a couple hour interlude between the mass ending (2:30pm on Saturday was the latest I could have a wedding mass) and so parents were able to drop off their children to their homes with awaiting babysitters. And to those who traveled in town, I arranged for babysitters (that they had previously met) to go to their hotel rooms. I would never have kept children away from the wedding, but the party was different for me. Kinda like having a night out to dinner with friends. We don’t shy from taking our kids anywhere – out to dinner, planes, nice stores, so I am not ok with keeping kids out of everything, but sometimes I just want some time with my husband where we are just husband and wife and not also mommy and daddy. We had our wedding mass during the regularly schedule Saturday evening Mass so that the parish community would there. I still have people come up to me and say how wonderful it was to be able to attend, and that they pray for us. Our wedding was planned that way, my husband’s brother liked the idea so much that when he had to rush his wedding because of a job relocation he did it first 6 months before us. I also love baptisms during regular Mass, which was common in my childhood parish but very rare at our current one. Our first bundle of joy is on the way, and will be baptized with the parish present. In some cultures the whole village is involved in weddings, and funerals. We had one priest from overseas who couldn’t believe how few people would attend parish funerals. I know this way of celebrating the sacraments is not what everyone in every parish will want, but it was right for us. My brother married a really awesome chick. They met in middle school, and life took them on different paths. They both had kids from prior relationships. Then those kids ended up in the same class, and my brother found his nerd-girl again. When she planned the wedding, she made space for kids. She set out tables with coloring books and crayons, and games for them. She had bubbles and sidewalk chalk, and kid food like chicken nuggets. It was an awesome wedding, save certain relatives who will not be named or described that made off with as much wedding cake as possible, and several of us did not get any of it, and a gust of wind blowing a door open into their table breaking one of the champagne flutes I gave them. And the two shall become one. Good thoughts. We had kids at our wedding but those thoughts didn’t even cross my mind. And also.. we weren’t catholic either and deeply saddened that we missed out on a catholic wedding.